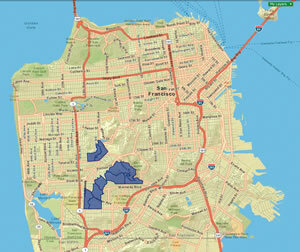 Located in San Francisco's District 7, Connoisseurs had the highest density of program participation (shown in purple) and was identified as the primary segmentation type to respond to direct marketing. With the effects of climate change increasingly evident and greenhouse gas reductions now being required by many state and local governments, more cities are looking for ways to reduce the carbon output of single-family homes. Consider San Francisco, California. Its Department of the Environment (SFE) recently completed a successful initiative to improve home energy efficiency with the help of Esri Community Analyst, a web-based mapping and reporting tool. 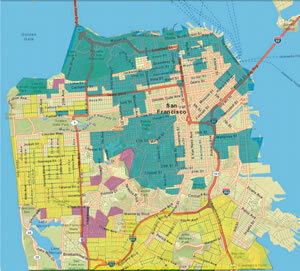 Embedded with up-to-date population and segmentation data on the entire United States, Community Analyst gave the department a granular perspective of San Francisco consumers, resulting in much more effective use of limited funds and more purchases than would have been possible otherwise. In 2008, the San Francisco Board of Supervisors set a greenhouse gas reduction target of 80 percent below 1990 levels by 2050. With residential housing accounting for 22 percent of the city's greenhouse gas emissions, reducing home energy consumption has never been more important. To reach that goal, San Francisco participated in Energy Upgrade California, a statewide energy management initiative with a two-pronged mission to educate California property owners about energy conservation and make energy upgrades more affordable. To increase the number of energy-efficient homes, San Francisco Department of the Environment developed a program to incentivize the city's homeowners to invest in deep but costly energy retrofits to their homes. To be successful despite a very limited marketing budget, SFE needed a plan to promote the program to homeowners who would be most likely to undertake such a major commitment. The department decided on a multifaceted outreach campaign that would begin with direct mail and citywide advertising and conclude with old- fashioned door-to-door outreach. Before putting feet to pavement, the department achieved widespread awareness of the program through newspaper ads, signage, and leaflets in official city mailings. The city crafted its messaging for seasonal context, publishing ads declaring "It's Outta Here!! "—a reference not only to the reigning World Series champion team, the San Francisco Giants, but also to precious heat escaping from homes during the city's damp winters. The department estimated that at least 250,000 residents would see the ads for Energy Upgrade California. "We needed to introduce Energy Upgrade California to the public," said Luke Easdale, marketing and outreach coordinator for the city's energy program. "We determined the most effective way to initially raise program awareness was through citywide advertising and marketing channels." Although the state also offers Energy Upgrade California services to multifamily homes and commercial property owners, the department decided to market to single-family homes to simplify its demographic analysis. Using Community Analyst and census block demographic data, San Francisco Department of the Enviroment identified three key segments where residents would likely consider purchasing energy upgrade packages. Since not all residents are homeowners or have the means or motivation to perform green retrofits on their homes, more targeted marketing was needed to complement the citywide awareness campaign. The department would first need a mechanism to understand the entire San Francisco community, both geographically and demographically, then focus on neighborhoods with the highest potential for program participation. This approach enabled the team to allocate its limited financial and volunteer resources more efficiently. People's demographic and lifestyle details—income, retail spending potential, utility costs, environmental and political group participation, media preferences, and spending patterns—would provide key insight into the areas that would be most receptive to the program. Community Analyst, integrated with demographics and Tapestry Segmentation data, enabled the team to locate and market the program to the most receptive residents. "The complexities of Energy Upgrade California—San Francisco are difficult to succinctly summarize in widely distributed collateral," Easdale said. "Ads and bus-stop signs should be used to drive overall awareness, but they must be complemented by informed local outreach methods to ultimately be effective." The Esri Tapestry Segmentation system divides US residential areas into 65 distinct segments based on socioeconomic and demographic characteristics to provide an accurate, detailed description of US neighborhoods. Tapestry Segmentation can help identify targeted markets, define product and service preferences, and tailor marketing messages to fit specific audiences. Traits such as income, net worth, and spending patterns can be useful in predicting consumer behavior, especially when those attributes are represented on a map. Tapestry Segmentation data is available as reports and maps in Community Analyst and other Esri business intelligence products. "From the outset, we wanted a simple visualization and reporting tool that would present the data accurately and help drive our interactive campaign," said Easdale. "A map-based app would give us an overview of the communities that we should visit, which was absolutely essential given our resources." Using Tapestry data in Community Analyst, Easdale identified markets to focus on during the final interactive campaign for Energy Upgrade California. To learn more about the types of people who might be interested in the offer, the team started by plotting the locations of residents who'd bought Energy Upgrade packages in previous years. Once plotted, Easdale used Community Analyst to look for clustering and commonalities of these completed projects. Tapestry identified Connoisseurs neighborhoods as the primary target owing to their past program participation. Residents of these neighborhoods tend to be wealthy, well-educated, married couples who own their homes and engage in civic activities. 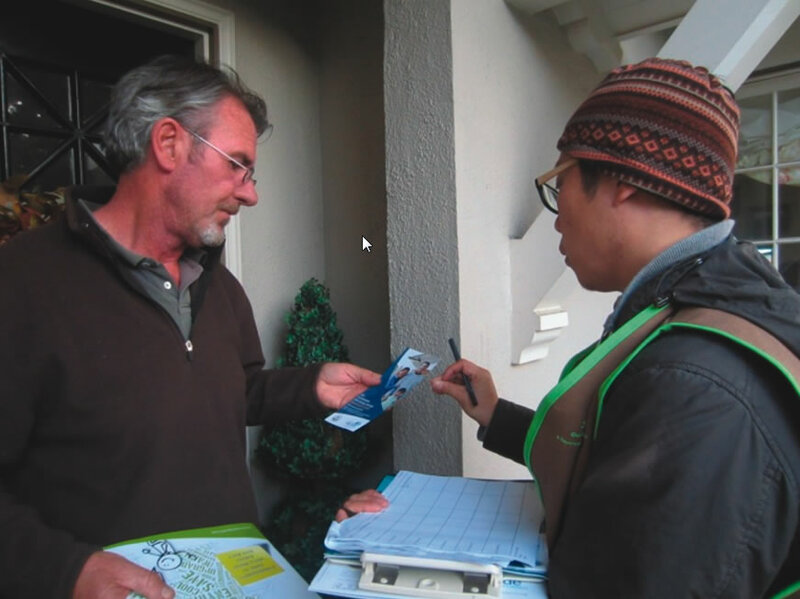 Door-to-door sales staff engaged homeowners by explaining the energy program and providing collateral. 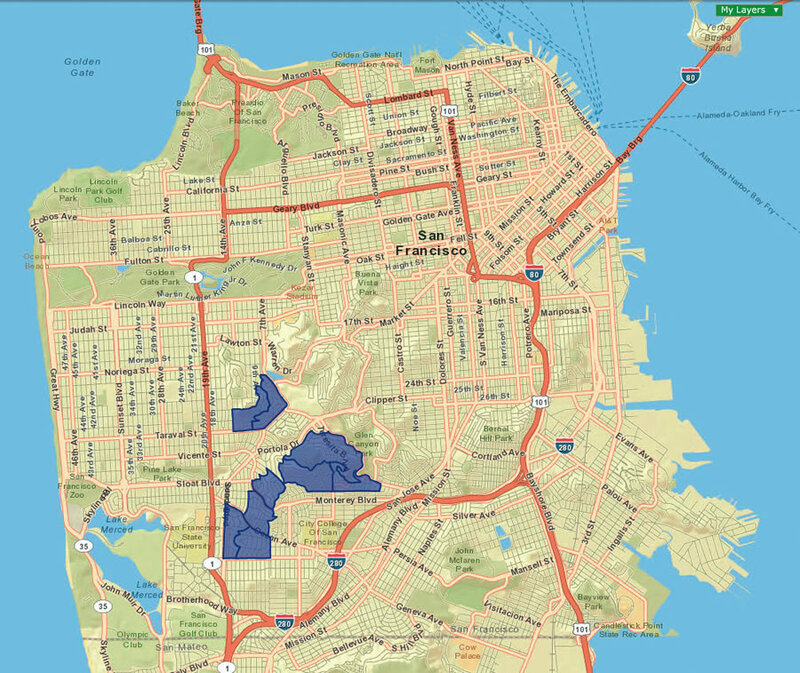 Because Community Analyst displays data geographically, the team was able to see a concentration of Connoisseurs neighborhoods in San Francisco's District 7—clearly pointing where teams should visit during the door-to-door campaign. The team used Community Analyst to map individual residential addresses to organize customized "walk sheets" so staff could save time and walk continuously from address to address. Community Analyst also revealed potential in the Laptops and Lattes and Pacific Heights neighborhoods. Community Analyst showed concentrations of these segments in five distinct districts, giving even more focus and direction to the team's interactive outreach planning. Careful crafting of scripts for door-to-door presentation, as well as offering deep discounts for retrofit projects, helped strengthen the final targeted phase of the campaign. Packages consisted of insulation retrofitting (to conserve cool and warm air) and the replacement of old, energy-sucking appliances (such as antiquated water heaters and gas furnaces). Because of the high cost, even residents of the Tapestry targeted neighborhoods, who could afford the packages, would need incentive for buy-in. To sweeten the deal, staff offered rebates of up to $5,000 per home. "The high out-of-pocket cost of an energy upgrade was identified as one of the largest barriers to homeowner participation," said Easdale. "Incentives attracted homeowners who didn't have the means to cover an entire upgrade." Besides those financial factors, attributes such as environmental group participation would also be evaluated within Community Analyst—lending further refinement of the department's route planning. Map-based demographic and lifestyle research tools that facilitate understanding are an essential tool in wide-scale marketing campaigns such as Energy Upgrade California—San Francisco. Visual orientation instantly conveyed to the department where its outreach team should go, whereas spreadsheets of population data would only have served to confound research. Thanks to its extensive preliminary research and staggered marketing, the department was able to exceed its expected sales by 81 homes. Reuben Schwartz, who manages the department's residential energy efficiency programs said, "Correlating energy consumption to both geographic and demographic traits of our residents is critical to our success. Esri's tools were an invaluable tool to help us make those connections." For more information, contact Luke Easdale, outreach coordinator, San Francisco Department of the Environment.